This essay is conceived as a reaction to the past conference Shaping Cities of the Urban Age at the 2016 Venice Biennale, Reporting from the Front. In light of numerous global crises, urban explosion, housing shortages and rising social movements, contemporary architecture is increasingly being pushed to investigate the social dimension, impact and implications of urban design. In particular, architectural education institutions and practices are expected to be more focused on the social fabric and to address current economic and politic scenarios. How could design dialogue positively influence the great social phenomena in cities where the scarcity of resources, migration, urban informality, global warming and economic crises are the most thriving endeavours? The essay speculates that the importance of labour of slums’ dwellers can assist planners and architects to design with social impact. Authors who study informal settlements usually do not mention that labour practices are the main driving force behind the design of slums. Labour is currently shaping the slums, in terms of material usage and otherwise. These findings will be compared to empirical data that were personally acquired from Brazilian slums 2 during the period from 2009 until 2016. Overall, the objective will be to try and consider social aspects within a method of design. With the same logic, the price of rent, land and property in favelas is consistently rising, almost proportionately with prices in the cities. Residents generally compare the prices of rent within the favela itself. In 2014, a typical house for rent in a favela (50 m2) would cost 350 Brazilian reais per month (US$106.88). 5 in the city of Maceió. In general, this is practically half of what one could ask in a middle class neighborhood within Farol, a neighborhood where a typical house for rent (50 m2), would cost circa 600 Brazilian reais per month without taxes (US$183.22). 6 Such discrepancies are slightly higher amongst people who live in big metropolitan areas such as Sao Paulo and Rio de Janeiro, which makes it much more affordable for low-income groups to dwell in slums. In this scenario it may be observed that a capital incursion is developing within favelas: supermarket chains and products are expanding, real estate has arrived: people who received houses from the PAC (Programa de Aceleração do Crescimento) are illegally selling their tenure for higher prices. 7 Hipsters, creative classes and gringos are moving to favelas, in the process of which they contribute to the gentrification of land and goods. Apart from this, one may note that investment in hotels, museums, social activities, NGOs, UPPs (Unidades de Polícia Pacificadora) and other similar activities are constantly increasing. The aforementioned notions express the fine line between considering the favela as an idealistic, unknown dimension with an abstract logic (this is a typical way to romanticizepoverty), or stating that favelas are entirely articulated with materialistic and accumulative values. The difference between these two views should be highlighted. Man building a house in the Favela Sururu de Capote. Photo by Author, 2009. The definition of “slums” varies significantly from one country to another. Slums relate to various phenomena such as urban informality, industrialization processes, rural-urban migration and lack of housing policies. Nevertheless, the UN defines slums as dwellings with a lack of minimum hygiene standards, infrastructure and living spaces. They are often attributed to countries of the Global South, but there are numerous records in literature showing the presence of slums in the Global North. The depictions of slums in London by Friedrich Engels in the nineteenth century, the bidonvilles in Montparnesse, bairros de lata in Portugal, Little Italy in New York and the lamiere in Italy are only a few examples. In these countries, slums are not just something of the past, but they exist even today, and can be instigated by factors such as social inequality (e.g. Clarkson Avenue in New York) and migration from war and poverty (e.g. the bidonville near Porte de Clignancourt in Paris). Slums were an issue in the past, they are a challenge in the present and they will continue to be a great concern in the future. Slum populations will be on a significant rise in the next few years according to seminal public debates and institutions such as the “Urban Age” by the London School of Economics and Alfred Heerhausen Society, Habitat III, as well as the Venice Biennale. In contrast to other slums, favelas are some of the most consolidated slums because they are located in Latin America, which is the most urbanized continent in the world. In Brazil, more than 80% of the population lives in urban centers. Favelas seems to be the only affordable option for most of the low-income groups in Brazil. Many of these people are not connected to the sewage system and do not benefit from waste collection services. In this sense, informal processes can be seen as having a leading role in shaping urban environments. The high housing deficit in Brazil has caused the Federal Government to establish a Program to House low-income groups and removed inhabitants of slums: Minha Casa Minha Vida (MCMV). Favelas are very emblematic spaces but they are stigmatized as having high crime rates and poverty. State agencies and institutions show little interest in working within such contexts (e.g. 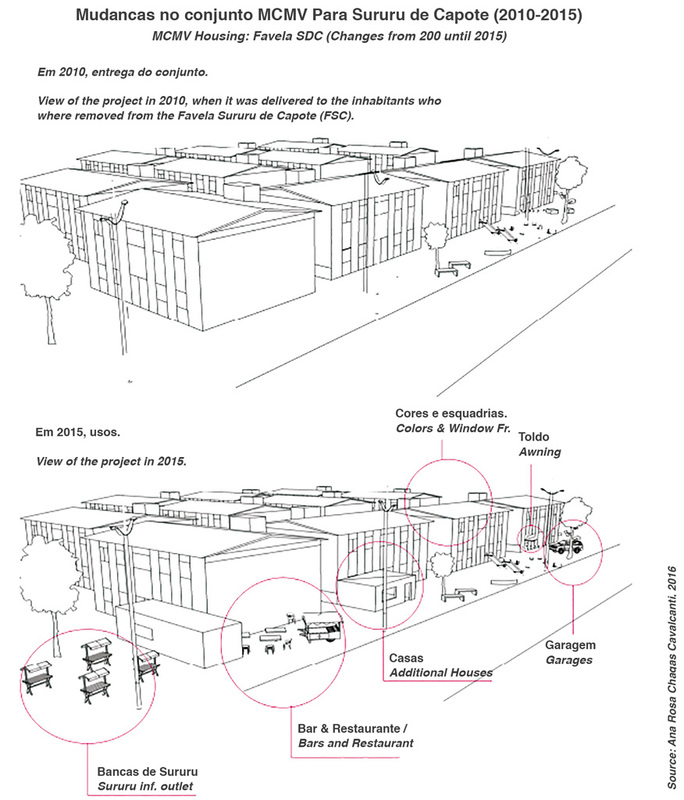 Favela Bairro) by removing inhabitants from risky areas and relocating them to social housing complexes (e.g. MCMV). Nevertheless, such projects would not consider the social practices of inhabitants and thus fail to achieve qualitative results in the design process. These complexes are located at the peripheries because land is cheaper, infrastructure is poor, and building designs are usually standardised. Furthermore, there is a capital incursion in the favelas. Shopping malls and supermarket chains are investing in favelas and inducing a consumption model that addresses the new favela middle class. 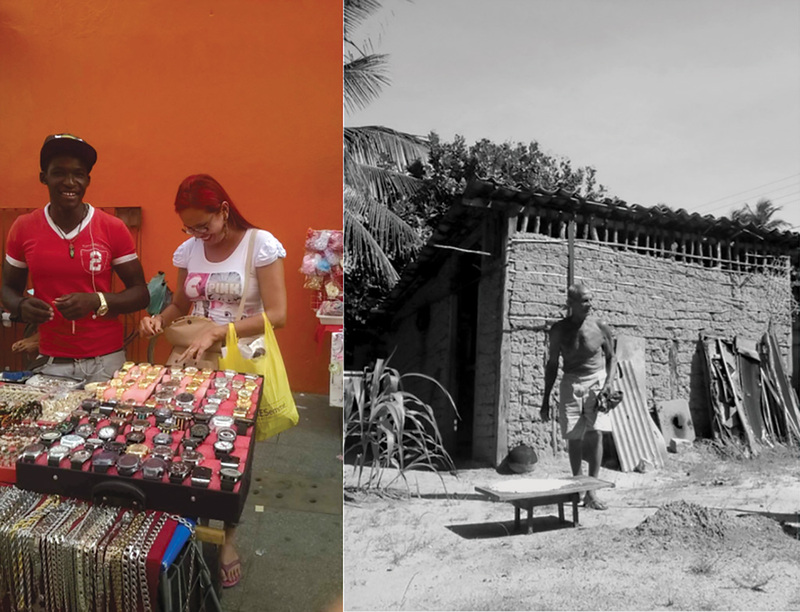 This model mirrors the standards found in the middle class in Brazil to the classes C and D. 8 Goods can be paid through instalments, and credit given to most low-income groups. Some of the pitfalls resulting from such capital incursion is gentrification, which forces the poorest of the poor to move to peripheral areas to build new slums. The population in slums is not homogenous. This has been partially due to the migration of artists, gringos, creatives, and hipsters to favelas who are attracted by the romanticized idea of slums or lower rental prices. This can be viewed as a hipsterization of slums. Another important aspect is that the actual participation of slum dwellers in political life is still challenged, with laws such as the Estatuto da Cidade and the Lei de Assistência Técnica still in dire need to overcome bureaucracy. Also detrimental to this inclusion is the political interest by mayors or institutions, political clienteles and a strong patriarchal rationale, especially in cities that are not located in highly urbanized areas. 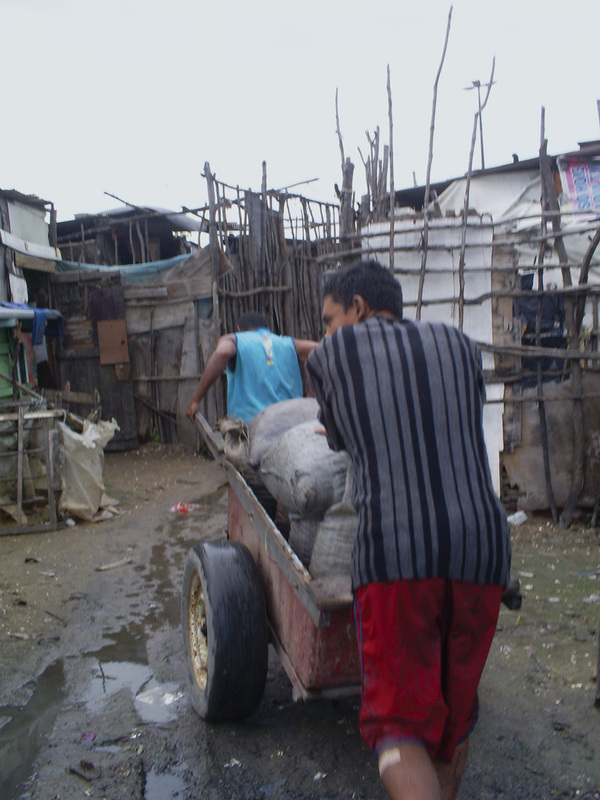 The working practices described above are not only necessary to allow the subsistence of dwellers, but tackle a broader ecology of slums indicating the emergence and slum growth in the world within a greater economic system. It seems that a new cartography of economic flows is falling into place, whereby some international manufacturing sectors can benefit from the work of slum dwellers. However, it is worth mentioning that inherently, a spatial inequality is embedded within the process of emergence and slum growth through the rise in migration of dwellers from rural to urban areas. These migrants are thriving through labour opportunities in cities. An example is the Favela Sururu de Capote, whose makers are actually migrants from rural areas. There is also an awareness towards the fact that the social practices within slums are replicated in social housing, especially those related to labour. Also, the incremental qualities and processes of building which were also documented in the literature of slums (e.g. John F.C. Turner and Charles Abrams 12) should be not taken for granted. The expansion of a house is not always related to the expansion of a family but is also related to working practices. Labour activities are not directly related to design processes in the literature of slums, but it is usually tangentially addressed. 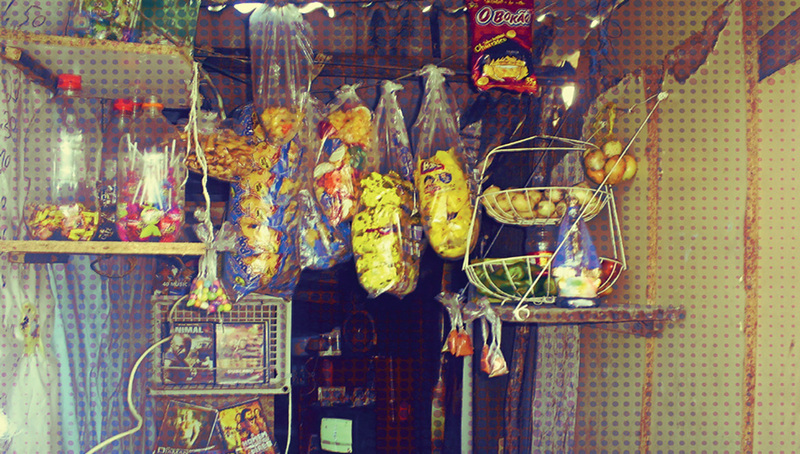 Window-shop, a spatial device that allows inhabitants to trade products and preserve their domestic lives. Photo by Author, 2009. The “logic of labour” was so strong that when inhabitants moved to institutional social housing (such as one project which was financed by MCMV), the inhabitants started to change the design of the buildings. Walls were turned down and new economic activities such as hairdressing salons; electric services, clothes repair services, sururu sales points and other improvised spaces (such as ones to sell sururu) became apparent within this social housing complex. The importance of labour to inhabitants who have been removed from slums is also very important and perhaps more urgent in the context of inhabitants who are transferred to social housing. Once relocated, inhabitants have to pay bills, electricity and legal fees and although they have their tenure secured, they have to maintain their dwellings. Man carrying sururu along the alleys of the Favela Sururu de Capote. Photo by Author, 2009. 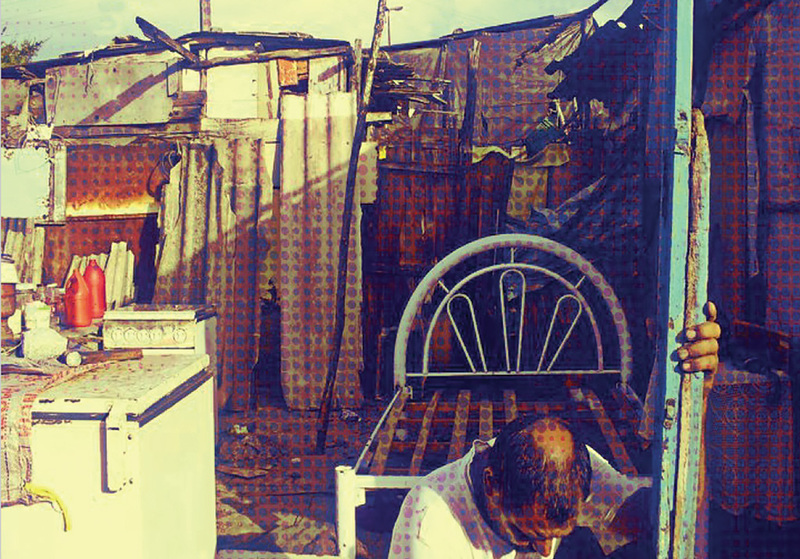 In favelas, residences are usually spaces where inhabitants both dwell and work. These are the kind of inhabitants who open nurseries, praying services, grocery shops, ice cream shops, sewer services, carpentry, masonry, or magnificent ironwork workshops, car repair shops, market sellers, hairdressers, clothes shops, bars, restaurants, and tattoo shops. They are also taxi drivers, maids, hairdressers, shop vendors, market vendors, public school teachers, hawkers, carter drivers, guards, policemen, masons and others who live in the favela but work in the so called “formal city.” The favela can be described as a place with a network of opportunities and skilled individuals who continually transform the space. People in favelas are well informed, hardworking and routinely update their knowledge and capabilities. Thus, it is somewhat symbolic to state that a favela is a doorway for the proletarian class to thrive as there is a healthy, active network of opportunities and skilled workers. Modifications in social housing buildings related to working activities. By Author, 2009. However, in the two case studies concerning favelas that have been studied through ethnographic research (i.e. the same methodology) there is barely work dissimulation: inhabitants place signboards and are proud to show their economic activities, especially at the bottom of houses. Work happens in the street, and it is evident to see the place thrive in alleys and spaces around the slums. Finally, the parochial concept of Ananya Roy 23 is brought forward. She claims that there is a new epistemology expressed by dwellers who produce concepts which are equally rich for us to understand informality. Informal planning is a varietal form of planning and it redefines relationships that are not contradictory to those of formal planning and has its own logic and synthesis (labor shaping spaces and forces within slums is one of these proofs). Above all, the aim is to explore labour in slums in a way that uncovers binary generalizations of formal and informal processes, which shows informal planning as a terrain where work, housing rules and market are not normally applied. In the following section, the impact that labour has on shaping spaces in the favela at several scales (the territorial scale, the city scale and the favela scale) will be showed. On a territorial scale, the capital and the formation of capitals within cities will be discussed. Across the world, labour territories contribute to the emersion and growth of a slum. The distribution of labour and settlement with respect to opportunities, provision of infrastructure will be discussed, bringing to light new assemblage opportunities of work. Finally, at the favela scale the design of houses produced by inhabitants are discussed. These houses are designed to flourish, securitize, and perpetuate work activities yet at the same time to preserve the concurrent domestic lifestyle. Cities are concentrations of opportunities, jobs, education, health and recreation. Thousands of people move to cities everyday. Cities are also social vehicles which deliver public policies aimed at improving people’s qualities of life; They have more efficient access to sanitation, to education and transportation. Critical mass and knowledge creation are also other important features of cities. The difference between rural and city dwellers’ income is crucial to understand the housing crises that most are currently facing. Institutions and corporations tend to turn a blind eye towards the increase in slums because the more jobs offered by the city, the bigger the housing problem, and this is a problem that cannot be solved instantly. Generally, countries without rigid regulations do not pay much attention to the relation between jobs, opportunities and housing, a situation that is further enhanced by the global crisis. According to David Harvey, 26 informality is the core process of neo-liberalism. Thus, labour opportunities and business networks are attracting people to go to cities. This migration is indisputable and unfair for those people who save money in the rural setting. Slums are a consequence of that process. Flows of people and goods to the slums in Maceio (red) and destination of goods produced in slums in Maceio within a broader economic system. 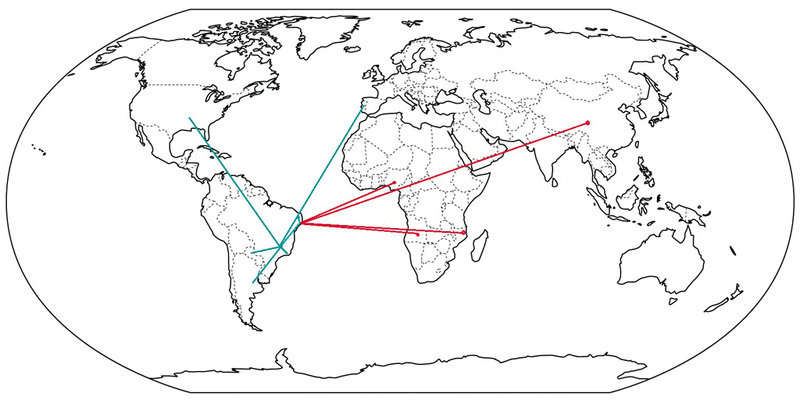 Migrants and inhabitants of favelas (transnational migration from Africa and rural northestern regions). Photo by Author, 2015, 2009. However, slums create their own central nodes within themselves, points of architectural relevance, which should be explored in terms of their spatial quality, cartographic nature and territorial infrastructure. Slums and centres are often referred through these binomials. Despite their material limitations, informal cities are becoming relevant economic actors on a global scale.29 Interestingly, such distribution patterns of centres and peripheries seem to be the same in the suburbs in Europe. This is also explicit in literature in the fact that favela dwellers are mostly people from the countryside: people who live in the suburbs but work in the city centre or new industrial areas as was explored in the case studies. Upon examination of Brasilia, Edesio Fernandes and Peter Keller observe that there seems to be a wider process in place, and they state that Brasilia was planned out of the blue. Workers built the boundaries of the city by contributing to it through manual labour and nowadays it has some of the vastest slums in Brazil (such as the Favela Sol Nascente). In this context, formal and informal are inseparable and undefined. Similarly, Alfredo Brillembourg states that slums are recycling machines. 30 Slums are not mere entry doors of the work in the cities as modern theorists such as John Turner believed, they are permanent places in the cities, especially because there is labour opportunity within the slum. It is important to stress that diligent business strategies do happen in reality, sometimes using child labour who are paid less than a minimum salary. In total, slums may become significant labour working forces in cities and there must therefore be some awareness to dignify the working conditions within them. Within the material agglomerations and spatial attributes of a favela, work and all that revolves around it becomes highly important. Throughout seven years of research on the Favela Sururu de Capote (FSC) it has been observed that many of the houses and spatial attributes were related to work practices of the inhabitants. 31 The incremental capacity of the space should not be taken for-granted or associated with the bucolic idea of a family which finds itself a piece of land and self-builds its own home due its uncontrolled growth. Many of the modifications and spatial adaptations have a purpose related to the working activities of the inhabitants. Alleys were built straight to allow for the working activities, thus there is a planning rationale to protect both the domestic and commercial activities of slum dwellers, allowing them to co-exist at the same place, and a planning rationale to dispose the sururu, transport it and so on. Houses and shops in the slums have to be connected to working areas and this should be considered by any social housing project addressing removed inhabitants of slums. Unfortunately the two projects delivered to the FSC, a self-help project in the 1980s and a mass housing project in 2010, did not address the social practices of people. The aim of this essay was to provide an insight for designers who want to address social housing plans in the context of slums and proletarian classes, combining results from personal fieldwork with theoretical studies presented at the 2016 Venice Biennale. The importance of considering labour as a design factor within informal settlement development was highlighted here to stress questions raised at the Biennale. At that forum, Aravena stated that, irrespective of their political, economic or environmental views, architects are ultimately designers. 32 In today’s world, the impact of architectural design in cities is not only an effort to synthetize issues on a single project, but also an effort to theorise on how complex social phenomena directly affect individual lives in everyday life. The search for a social position in architecture may go through the observation of everyday life. New methods, tools and definitions of informal architecture and informal planning are needed. Experimental methods and tools must address issues that are never taught to architects, as says Aravena. 33 Social practices are taught as something very different from the architecture education, but architecture is born from a social practice. Social practices need to be taught as a relevant aspect of design, there is a need for synthesis of social practices into architecture pedagogy. Architecture practices in slums should not be a monolithic activity but more like a summary of many other disciplines such as political economy, sociology and anthropology. Independently of the orientation of architects who aim to work within the existing contexts of slums (activists, or institutional architects), there must be an awareness of the social practices within these slums. They are still considered to be part of another field of inquiry: instead, they must be translated into a design language as pedagogical tools for future architects and urban planners. Urban Age. “Shaping cities, la biennale di Venezia, 2016”. https://urbanage.lsecities.net/conferences/shaping-cities-venice-2016. Ana Rosa Chagas Cavalcanti, “Critical Roles of Architecture,” paper presented at the II CriticAll Conference, Madrid, June 2016. Ana Rosa Chagas Cavalcanti, “Dos calejados pés os filhos de mae lagoa: a invenção do espaço a partir dos ritos de Sururu" (graduation thesis, Universidad Federal de Alagoas, 2009). Currency converter (12 September 2016). Brazil Investment Guide, “Real Estate Speculation in Brazil´s Favela Communities,” published on March 14, 2013. Youtube video: https://www.youtube.com/watch?v=QIIOCQdpJAk. Classes C and D, also known as the Brazilian “middle class,” are defined by Brazilian scholars as social groups in which individuals earn from 291 Brazilian Reais (US$88.76) up to 1019 Brazilian Reais (US$310) per month. Currency converter (30 November 2016). Alejandro Aravena, “Reporting From the Front,” July 2016, https://LSECiti.es/u32c6138a. Paola Berenstein, A estética da Ginga: a arquitetura das favelas através da obra de Hélio Oiticica, Salvador (Br. ): Casa da Palavra, 2001. See: Charles Abrams, Man’s Struggle for Shelter in an Urbanizing World, Cambridge MA (USA): The MIT Press, 1964, and John F. C. Turner, Housing by People: Towards Autonomy in Building Environment, London: Marion Boyars, 1976. See Sheela Patel and Jockin Arputham, “Plans for Dharavi: Negotiating a Reconciliation between a State-Driven Market Redevelopment and Residents’ Aspirations,” Environment & Urbanization 20, no. 1, April 2008. AbdouMaliq Simone, “Feral Urbanism,” July 2016, https://LSECiti.es/u2201130f. SPARC India, “Dharavi,” published on 17 March 2010, Youtube: https://www.youtube.com/watch?v=EUMMq7B_DDs. Mike Davis, Planet of Slums, London: Verso, 2006. Robert Neuwirth, Shadow Cities, New York: Routledge, 2006. See: Manuel Castells, The Urban Question. A Marxist Approach, London: Edward Arnold, 1977, and David Harvey, Rebel Cities: From the Right to the City to Urban Revolution, London: Verso Books, 2013. See: Rob Kitchin and Gill Valentine, Key Thinkers on Space and Place, London: Sage, 2004. Gilles Deleuze and Felix Guatarri, A Thousand Plateaus: Captalism and Schizofrenia, Minneapolis MN (USA): University of Minessota Press, 2001: 202. Ananya Roy, “The 21st-Century Metropolis: New Geographies of Theory,” Regional Studies 6, no. 6 (2009): 819–30, doi: http://dx.doi.org/10.1080/00343400701809665. Joan Clos, “The Case for Planning,” July 2016, https://LSECiti.es/u50c213d7. Eduardo Rojas, “Governance and City Making in South America,” presentation at the Urban Age in South America Conference, Sao Paulo, December, 2008. David Harvey, Rebel Cities, cit. Edésio Fernandes, Regularization of Informal Settlements in Latin America, 2011, http://www.lincolninst.edu/publications/policy-focus-reports/regularization-informal-settlements-latin-america. Saskia Sassen, “Global Capital and Urban Land,” July 2016, https://LSECiti.es/u18fe1280. Ricky Burdett and Deyan Sudjic, Living in the Endless City, London: Phaidon, 2011. Alfredo Brillembourg, Kristin Feireiss, and Hubert Klumpner, eds., Informal City: Caracas Case, Zurich: Prestel Verlag, 2005. Ana Rosa Chagas Cavalcanti, “Critical Roles of Architecture,” cit. Alejandro Aravena, “Reporting From the Front,” cit. Alejandro Aravena, “Architects ‘ Are Never Taught the Right Thing ’ Says 2016 Pritzker Prize Alejandro Aravena,” interview by Anna Winston, 13 January 2016, https://www.dezeen.com/2016/01/13/alejandro-aravena-interview-pritzker-prize-laureate-2016-social-incremental-housing-chilean-architect/. Ana Rosa Chagas Cavalcanti studied architecture and urbanism at the Universidade Federal de Alagoas (UFAL), Maceió, Brazil (2004-2009). In 2012, she earned her master’s degree (at La Sapienza, Rome, and ENSA Paris-Val-de-Seine). She worked in several architecture offices, won some architecture competitions and exhibited at various architecture events. She is currently a PhD candidate at the TU-Delft (NL). In 2014, she founded “The School of Favela Architecture”, an urban laboratory in the “Favela do Telegrafo”. In 2015, she received a fellowship by the International Journal of Urban and Regional Research (IJURR), within the “Authors Meet Critics 2015 (AMC 2015)” program. E-mail: a.r.chagascavalcanti@tudelft.nl.